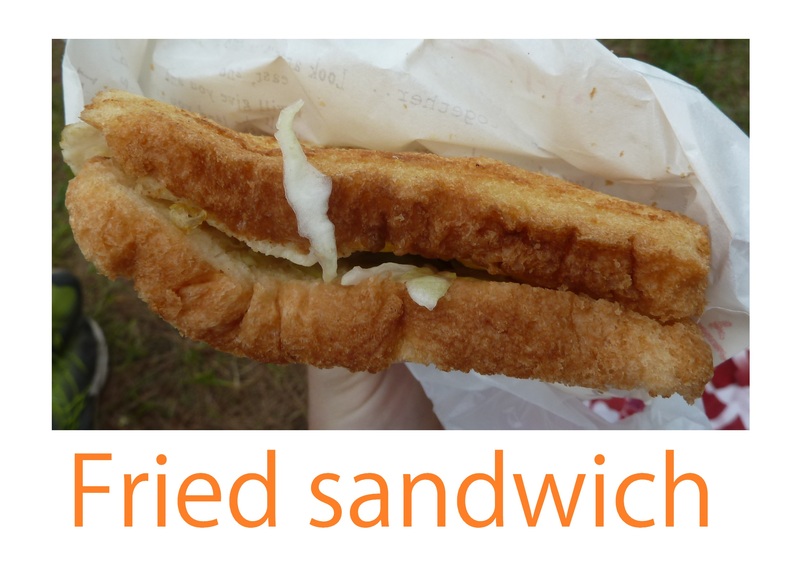 A way of cooking sandwich i’m not really find of: they fried the sandwich as well as what’s inside. I asked for vegetables, but you always have an omelette with it. Oily and sweet. I really prefer wester sandwich with real bread. 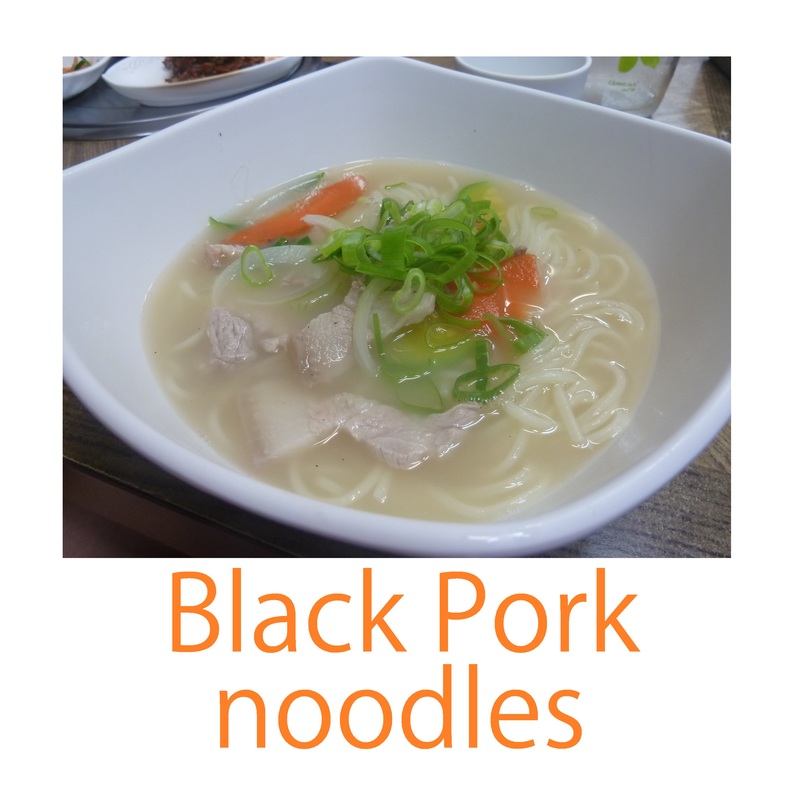 Like beef noodles, but with black pork! The broth is with pepper, pork, green onion, carrots. 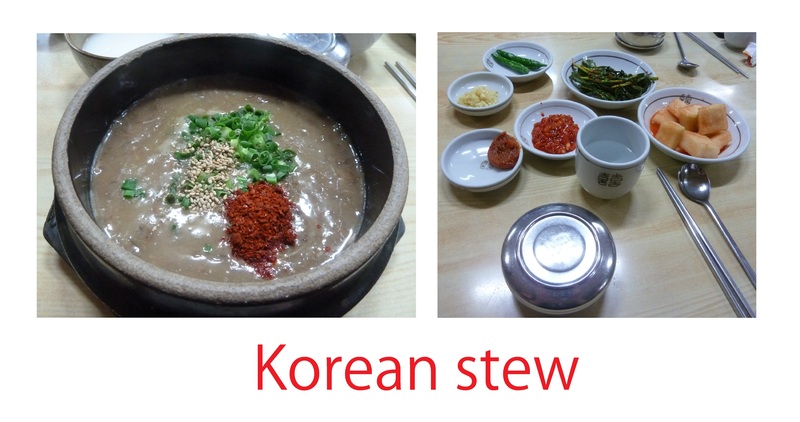 So actually it also has a taste very similar with the western broth. One of my friends loves Drunkin’ Donuts but they’re less popular in Taiwan than Mister Donuts so it’s pretty hard to find any. However in Korea that’s the opposite, so i decided to go for a try. The cheese cream inside the donuts are really not my piece of cake, same goes for their “caramel” which is more like an industrial cream that actual caramel. However for the jam filling, it reminded me of the donuts i used to buy on the beach when i was a kid with apricot jam inside (but here it was blueberry jam). But actually, it’s more about the memory than the food. Not fan of it, either Drunkin’ Donuts or Mister Donuts. Better do it yourself i think. A non spicy stew with meat! Actually it tastes like some french sauce of “Boeuf Bourgignon” and the meat is pretty similar too except that our pieces of meat are bigger and there’s more meat than sauce (here it’s the opposite). Like it, but i forgot the name of it. 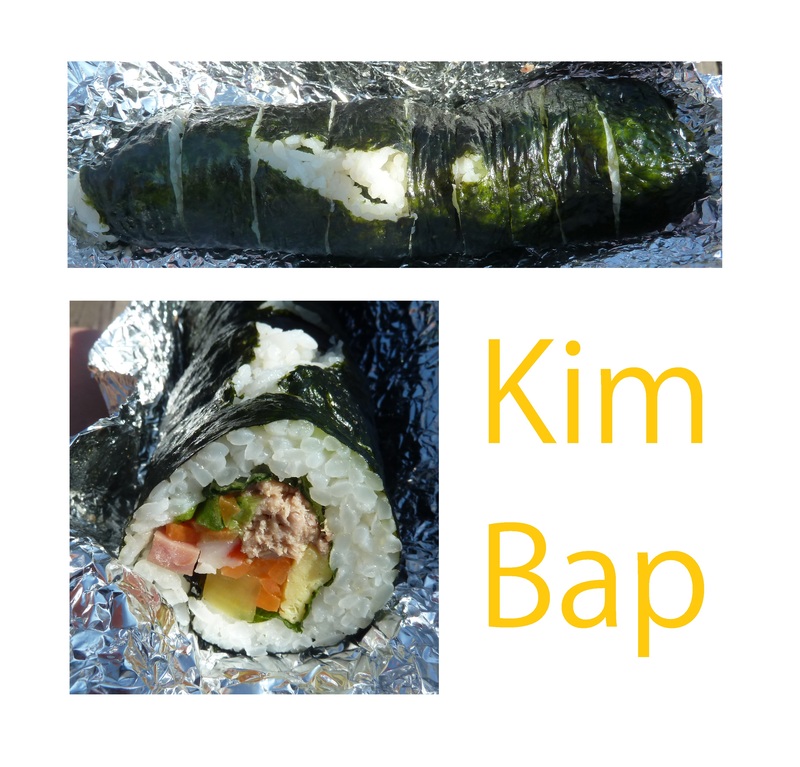 The most famous korean dish after kimchi: kimbap! I eat this for breakfast when we are hiking because it’s pretty big and can be considered as a brunch. Like Japanese maki, but the basic ones don’t have fish. 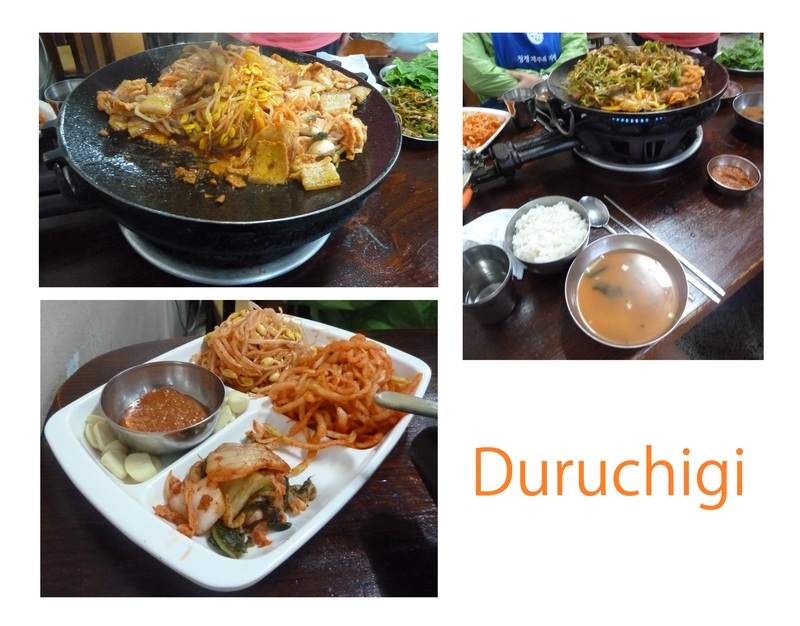 A new korean dish: Duruchigi. What is that? Black big with soy, garlic, cabbage in a pan/wok, and then you put it on a lettuce leaf with rice and wrap it like a nem. When i saw the fresh lettuce, i became totally mad, because in Taiwan it doesn’t exist. I miss fresh lettuce so much so i ate it all. The dish isn’t too spicy and you have everything inside: meat, veggies, and cereals with the rice. In Jeju, we tried a fancy burger: a big one that you share for 3 people. The ingredients are all fresh, with black big, apple, cabbage, onion, pickles, and it’s home-made. Delicious, and i like the fact that’s as big as a pie and that you can share. Furthemore, it’s a way easier to eat.